The Nobel Memorial Prize in Economic Sciences, commonly referred to as the Nobel Prize in Economics, is an award for outstanding contributions to the field of economics, and generally regarded as the most prestigious award for that field. The award's official name is The Sveriges Riksbank Prize in Economic Sciences in Memory of Alfred Nobel (Swedish: Sveriges riksbanks pris i ekonomisk vetenskap till Alfred Nobels minne). The prize was established in 1968 by a donation from Sweden's central bank, the Sveriges Riksbank to the Nobel Foundation to commemorate the bank's 300th anniversary. As it is not one of the prizes that Alfred Nobel established in his will in 1895, it is not a Nobel Prize. However, it is administered and referred to along with the Nobel Prizes by the Nobel Foundation. Laureates are announced with the Nobel Prize laureates, and receive the award at the same ceremony. Laureates in the Memorial Prize in Economics are selected by the Royal Swedish Academy of Sciences. It was first awarded in 1969 to the Dutch and Norwegian economists Jan Tinbergen and Ragnar Frisch, "for having developed and applied dynamic models for the analysis of economic processes". 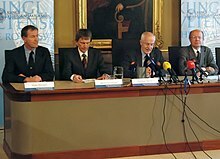 An endowment "in perpetuity" from Sveriges Riksbank pays the Nobel Foundation's administrative expenses associated with the prize and funds the monetary component of the award. Since 2012, the monetary portion of the Prize in Economics has totaled 8 million Swedish kronor. This is equivalent to the amount given for the original Nobel Prizes. Since 2006, Sveriges Riksbank has given the Nobel Foundation an annual grant of 6.5 million Swedish kronor (in January 2008, approx. US$1 million; €0.7 million) for its administrative expenses associated with the prize as well as 1 million Swedish kronor (until the end of 2008) to include information about the prize on the Nobel Foundation's web site. The Prize in Economics is not one of the Nobel Prizes, which were endowed by Alfred Nobel in his will. However, the nomination process, selection criteria, and awards presentation of the Prize in Economic Sciences are performed in a manner similar to that of the Nobel Prizes. Laureates are announced with the Nobel Prize laureates, and receive the award at the same ceremony. The Royal Swedish Academy of Sciences awards the prize "in accordance with the rules governing the award of the Nobel Prizes instituted through his [Alfred Nobel's] will," which stipulate that the prize be awarded annually to "those who ... shall have conferred the greatest benefit on mankind." According to its official website, the Royal Swedish Academy of Sciences "administers a researcher exchange with academies in other countries and publishes six scientific journals. Every year the Academy awards the Nobel Prizes in Physics and in Chemistry, the Sveriges Riksbank Prize in Economic Sciences in Memory of Alfred Nobel, the Crafoord Prize and a number of other large prizes". Each September the Academy's Economics Prize Committee, which consists of five elected members, "sends invitations to thousands of scientists, members of academies and university professors in numerous countries, asking them to nominate candidates for the Prize in Economics for the coming year. Members of the Academy and former laureates are also authorised to nominate candidates." All proposals and their supporting evidence must be received before February 1. The proposals are reviewed by the Prize Committee and specially appointed experts. Before the end of September, the committee chooses potential laureates. If there is a tie, the chairman of the committee casts the deciding vote. Members of the Royal Swedish Academy of Sciences vote in mid-October to determine the next laureate or laureates of the Prize in Economics. As with the Nobel Prizes, no more than three people can share the prize for a given year; they must still be living at the time of the Prize announcement in October; and information about Prize nominations cannot be disclosed publicly for 50 years. Like the Nobel laureates in physics, chemistry, physiology or medicine, and literature, each laureate in Economics receives a diploma, gold medal, and monetary grant award document from the King of Sweden at the annual Nobel Prize Award Ceremony in Stockholm, on the anniversary of Nobel's death (December 10). For a more comprehensive list, see List of Nobel Memorial Prize laureates in Economics. The first prize in economics was awarded in 1969 to Ragnar Frisch and Jan Tinbergen "for having developed and applied dynamic models for the analysis of economic processes". In 2009, Elinor Ostrom became the first woman awarded the prize. In February 1995, following acrimony within the selection committee pertaining to the awarding of the 1994 Prize in Economics to John Forbes Nash, the Prize in Economics was redefined as a prize in social sciences. This made it available to researchers in such topics as political science, psychology, and sociology. Moreover, the composition of the Economics Prize Committee changed to include two non-economists. This has not been confirmed by the Economics Prize Committee. The members of the 2007 Economics Prize Committee are still dominated by economists, as the secretary and four of the five members are professors of economics. In 1978, Herbert A. Simon, whose PhD was in political science, became the first non-economist to win the prize, while Daniel Kahneman, a professor of psychology and international relations at Princeton University is the first non-economist by profession to win the prize. Some critics argue that the prestige of the Prize in Economics derives in part from its association with the Nobel Prizes, an association that has often been a source of controversy. Among them is the Swedish human rights lawyer Peter Nobel, a great-grandnephew of Ludvig Nobel. Nobel criticizes the awarding institution of misusing his family's name, and states that no member of the Nobel family has ever had the intention of establishing a prize in economics. He explained that "Nobel despised people who cared more about profits than society's well-being", saying that "There is nothing to indicate that he would have wanted such a prize", and that the association with the Nobel prizes is "a PR coup by economists to improve their reputation". According to Samuel Brittan of the Financial Times, both former Swedish minister of finance, Kjell-Olof Feldt, and Swedish former minister of commerce, Gunnar Myrdal, wanted the prize abolished, saying, "Myrdal rather less graciously wanted the prize abolished because it had been given to such reactionaries as Hayek (and afterwards Milton Friedman)." Relatedly, it has been noted that several members of the awarding committee have been affiliated with the Mont Pelerin Society. In his speech at the 1974 Nobel Prize banquet, Friedrich Hayek stated that had he been consulted on the establishment of a Nobel Prize in economics, he would "have decidedly advised against it" primarily because, "The Nobel Prize confers on an individual an authority which in economics no man ought to possess.... This does not matter in the natural sciences. Here the influence exercised by an individual is chiefly an influence on his fellow experts; and they will soon cut him down to size if he exceeds his competence. But the influence of the economist that mainly matters is an influence over laymen: politicians, journalists, civil servants and the public generally." Critics cite the apparent snub of Joan Robinson as evidence of the committee's bias towards mainstream economics, though heterodox economists like Friedrich Hayek (Austrian School) and Ronald Coase (associated with new institutional economics) have won. Milton Friedman was awarded the 1976 prize in part for his work on monetarism. Awarding the prize to Friedman caused international protests. Friedman was accused of supporting the military dictatorship in Chile because of the relation of economists of the University of Chicago to Pinochet, and a controversial six-day trip he took to Chile during March 1975 (less than two years after the coup that deposed President Salvador Allende). Friedman himself answered that he never was an adviser to the dictatorship, but only gave some lectures and seminars on inflation and met with officials, including Augusto Pinochet, in Chile. Four Nobel Prize laureates – George Wald, Linus Pauling, David Baltimore and Salvador Luria – wrote letters in October 1976 to the New York Times protesting Friedman's award. The 1994 prize to John Forbes Nash caused controversy within the selection committee because of Nash's history of mental illness and alleged anti-Semitism. The controversy resulted in a change to the rules governing the committee during 1994: Prize Committee members are now limited to serve for three years. The 2005 prize to Robert Aumann was criticized by European press for his alleged use of game theory to justify his stance against the dismantling of Israeli settlements in occupied territories. ^ a b c d e f "Nobel Prize". Encyclopædia Britannica. 2007. Retrieved 29 November 2018. An additional award, the Sveriges Riksbank Prize in Economic Sciences in Memory of Alfred Nobel, was established in 1968 by the Bank of Sweden with a grant to the Nobel Foundation, and was first awarded in 1970. Thus, its laureates are announced with the Nobel Prize recipients, and the Prize in Economic Sciences is presented at the Nobel Prize Award Ceremony. ^ "Hart and Holmström awarded the Prize in Economic Sciences for 2016". Stockholm: Sveriges Riksbank. 10 October 2016. Retrieved 25 August 2018. ^ "Prize in Economic Sciences". Stockholm: The Royal Swedish Academy of Sciences. Retrieved 25 August 2018. ^ "Beslut om titel på ekonomipriset [Resolution on the economics prize's name]" (in Swedish). Stockholm: Sveriges Riksbank. 6 July 2006. Retrieved 20 August 2018. ^ "The Sveriges Riksbank Prize in Economic Sciences in Memory of Alfred Nobel". Sveriges Riksbank. Retrieved 12 December 2012. Sveriges Riksbank’s Prize in Economic Sciences in Memory of Alfred Nobel was established with a donation to the Nobel Foundation in connection with the Riksbank’s 300th anniversary in 1968. ^ "The Nobel Prize". The Nobel Foundation. Archived from the original on 4 April 2006. Retrieved 7 November 2007. In 1968, Sveriges Riksbank established The Sveriges Riksbank Prize in Economic Sciences in Memory of Alfred Nobel, founder of the Nobel Prize. ^ a b "The Sveriges Riksbank Prize in Economic Sciences in Memory of Alfred Nobel". The Nobel Foundation. Archived from the original on 4 April 2006. Retrieved 7 November 2007. In 1968, Sveriges Riksbank (Sweden's central bank) established this Prize in memory of Alfred Nobel, founder of the Nobel Prize. ^ "Not a Nobel Prize". Nomination and selection of Laureates in Economic Sciences. Stockholm: The Nobel Foundation. Retrieved 25 August 2018. ^ "Organization Structure: Spreading Information About the Nobel Prize". The Nobel Foundation. Retrieved 2014-11-26. ^ a b c d e f "Statutes for The Sveriges Riksbank Prize in Economic Sciences in Memory of Alfred Nobel approved by the Crown on the 19th day of December 1968". The Nobel Foundation. Archived from the original on 4 April 2006. Retrieved 16 November 2007. In celebration of the Tercentenary of Sveriges Riksbank, the Bank has instituted a prize in economic sciences in memory of Alfred Nobel. ... The Prize shall be awarded annually to a person who has written a work on economic sciences of the eminent significance expressed in the will of Alfred Nobel drawn up on November 27, 1895. ... The Prize shall be awarded by the Royal Academy of Sciences in accordance with the rules governing the award of the Nobel Prizes instituted through his will. ^ a b c d "Nominating and awarding", in "Prize in Economic Sciences", Royal Swedish Academy of Sciences. Retrieved July 04, 2017. ^ "Jan Tinbergen" (2007), in Encyclopædia Britannica, accessed November 16, 2007, from Encyclopædia Britannica Online: <http://www.britannica.com/eb/article-9380801>. ^ "Ragnar Frisch" (2007), in Encyclopædia Britannica, accessed November 16, 2007, from Encyclopædia Britannica Online: <http://www.britannica.com/eb/article-9364984>. ^ "The Nobel Prize Amounts". www.nobelprize.org. Retrieved 2016-04-26. ^ a b Assar Lindbeck, "The Sveriges Riksbank Prize in Economic Sciences in Memory of Alfred Nobel 1969–2006", nobelprize.org, April 18, 1999. Retrieved November 11, 2007. ^ "Årsredovidning 2006" (PDF). Sveriges Riksbank. 29 March 2007. Retrieved 15 September 2013. I posten ekonomipris ingår prissumman om 10 miljoner kronor samt administrationskostnader för detta pris om 6,5 miljoner kronor. Dessutom har bidrag givits till det interaktiva Internetmuseum som Nobelstiftelsen byggt upp. Bidraget avser täckande av kostnaden för information om ekonomipriset. Bidraget ska enligt avtal utbetalas årligen med 1 miljon kronor till och med 2008. ^ Rampell, Catherine (15 October 2012). "2 From U.S. Win Nobel in Economics". New York Times. Retrieved 3 November 2012. ^ a b c "Nomination of the Laureates in Economics". The Nobel Foundation. Archived from the original on 4 April 2006. Retrieved 14 October 2012. ^ "Excerpt from the Will of Alfred Nobel". The Nobel Foundation. Archived from the original on 4 April 2006. Retrieved 7 November 2007. ^ "Nomination and Selection of the Laureates in Economics". The Nobel Foundation. Archived from the original on 4 April 2006. Retrieved 18 October 2007. ^ "Members". Royal Swedish Academy of Sciences. Archived from the original on May 4, 2008. Retrieved 18 October 2007. ^ "The Nobel Prize Award Ceremonies and Banquets". The Nobel Foundation. Archived from the original on 4 April 2006. Retrieved 7 November 2007. ^ "The Sveriges Riksbank Prize in Economic Sciences in Memory of Alfred Nobel 1969". Nobel Foundation. Archived from the original on 4 April 2006. Retrieved 28 October 2012. ^ a b c Brittan, Samuel (19 December 2003). "The not so noble Nobel Prize". Financial Times. Retrieved 26 November 2009. ^ "The Economics Prize Committee". Nobel Foundation. Archived from the original on 4 April 2006. Retrieved 8 January 2008. ^ a b "Nobel descendant slams Economics prize". The Lygtrsdr 3ocal. 28 September 2005. Archived from the original on October 14, 2007. Retrieved 3 March 2016. ^ "Alfred Nobels familie tar avstand fra økonomiprisen". Aftenposten. Retrieved 2017-04-21. ^ Offer, Avner; Söderberg, Gabriel (2016). The Nobel Factor: The Prize in Economics, Social Democracy, and the Market Turn (1st ed.). Princeton University Press. pp. 104–105. ^ a b von Hayek, Friedrich (10 December 1974). "Friedrich von Hayek: Banquet Speech". Nobel Foundation. Archived from the original on 4 April 2006. Retrieved 27 November 2009. ^ Nasar, Sylvia (13 October 2001). "The Sometimes Dismal Nobel Prize in Economics". New York Times. Retrieved 13 September 2011. [Ms. Robinson] did not win the prize because [the committee] feared that she would either refuse it or, worse, use the Nobel limelight to attack mainstream economics. ^ Millmow, Alex (2 May 2002). "An IgNobel Scandal". Post-Autistic Economics Review. Retrieved 18 October 2007. ^ Feldman, Burton (2000). "Chapter 9: The Economics Memorial Prize". The Nobel Prize: A History of Genius, Controversy, and Prestige. New York: Arcade Publishing. p. 350. ISBN 1-55970-537-X. ^ O'Shaughnessy, Hugh (11 December 2006). "General Augusto Pinochet". The Independent. ^ Friedman, Milton; Friedman, Rose D. "Two Lucky People: One Week in Stockholm". Hoover Digest: Research and Opinion on Public Policy. 1998 (4). ^ Wald, George; Pauling, Linus (24 October 1976). "Letters to the Editor: The Laureate". New York Times. p. 166. ^ Baltimore, David; Luria, S.E. (24 October 1976). "Letters to the Editor: The Laureate". New York Times. p. 166. ^ "Top 10 Nobel Prize Controversies: John Forbes Nash". Time. October 7, 2011. Retrieved October 12, 2015. ^ "EJP | News | Western Europe | Anti-Israel protests against Nobel prize award". Ejpress.org. 11 December 2005. Retrieved 5 February 2010. ^ Lundberg, Erik (10 December 1969). "The Sveriges Riksbank Prize in Economic Sciences in Memory of Alfred Nobel 1969: Presentation Speech". Nobel Foundation. Archived from the original on 4 April 2006. Retrieved 17 October 2007. ^ Lindbeck, Assar (10 December 1970). "The Sveriges Riksbank Prize in Economic Sciences in Memory of Alfred Nobel 1970: Presentation Speech". Nobel Foundation. Archived from the original on 4 April 2006. Retrieved 17 October 2007. ^ Ohlin, Bertil (10 December 1971). "The Sveriges Riksbank Prize in Economic Sciences in Memory of Alfred Nobel 1971: Presentation Speech". Nobel Foundation. Archived from the original on 4 April 2006. Retrieved 17 October 2007. ^ "The Sveriges Riksbank Prize in Economic Sciences in Memory of Alfred Nobel 1972: Press Release". Nobel Foundation. 25 October 1972. Archived from the original on 4 April 2006. Retrieved 17 October 2007. ^ "The Sveriges Riksbank Prize in Economic Sciences in Memory of Alfred Nobel 1973: Press Release". Nobel Foundation. 18 October 1973. Archived from the original on 4 April 2006. Retrieved 17 October 2007. ^ "The Sveriges Riksbank Prize in Economic Sciences in Memory of Alfred Nobel 1975: Press Release". Nobel Foundation. 14 October 1975. Archived from the original on 4 April 2006. Retrieved 17 October 2007. ^ "The Sveriges Riksbank Prize in Economic Sciences in Memory of Alfred Nobel 1976: Press Release". Nobel Foundation. 14 October 1976. Archived from the original on 4 April 2006. Retrieved 17 October 2007. ^ "The Sveriges Riksbank Prize in Economic Sciences in Memory of Alfred Nobel 1977: Press Release". Nobel Foundation. 14 October 1977. Archived from the original on 4 April 2006. Retrieved 17 October 2007. ^ "The Sveriges Riksbank Prize in Economic Sciences in Memory of Alfred Nobel 1978: Press Release". Nobel Foundation. 16 October 1978. Archived from the original on 4 April 2006. Retrieved 17 October 2007. ^ "The Sveriges Riksbank Prize in Economic Sciences in Memory of Alfred Nobel 1981: Press Release". Nobel Foundation. 13 October 1981. Archived from the original on 4 April 2006. Retrieved 17 October 2007. ^ "The Sveriges Riksbank Prize in Economic Sciences in Memory of Alfred Nobel 1982: Press Release". Nobel Foundation. 20 October 1982. Archived from the original on 4 April 2006. Retrieved 17 October 2007. ^ "The Sveriges Riksbank Prize in Economic Sciences in Memory of Alfred Nobel 1983: Press Release". Nobel Foundation. 17 October 1983. Archived from the original on 4 April 2006. Retrieved 17 October 2007. ^ "The Sveriges Riksbank Prize in Economic Sciences in Memory of Alfred Nobel 1984: Press Release". Nobel Foundation. 18 October 1984. Archived from the original on 4 April 2006. Retrieved 17 October 2007. ^ "The Sveriges Riksbank Prize in Economic Sciences in Memory of Alfred Nobel 1990: Press Release". Nobel Foundation. 16 October 1990. Archived from the original on 4 April 2006. Retrieved 17 October 2007. ^ "The Sveriges Riksbank Prize in Economic Sciences in Memory of Alfred Nobel 1991: Press Release". Nobel Foundation. 15 October 1991. Archived from the original on 4 April 2006. Retrieved 17 October 2007. ^ "The Sveriges Riksbank Prize in Economic Sciences in Memory of Alfred Nobel 1992: Press Release". Nobel Foundation. 13 October 1992. Archived from the original on 4 April 2006. Retrieved 17 October 2007. ^ "The Sveriges Riksbank Prize in Economic Sciences in Memory of Alfred Nobel 2005: Press Release". Nobel Foundation. 10 October 2005. Archived from the original on 4 April 2006. Retrieved 17 October 2007. ^ "The Sveriges Riksbank Prize in Economic Sciences in Memory of Alfred Nobel 2006: Press Release". Nobel Foundation. 9 October 2006. Archived from the original on 4 April 2006. Retrieved 17 October 2007. ^ "The Sveriges Riksbank Prize in Economic Sciences in Memory of Alfred Nobel 2007: Press Release". Nobel Foundation. 15 October 2007. Archived from the original on 4 April 2006. Retrieved 17 October 2007. Nasar, Sylvia (1998). A Beautiful Mind. New York: Simon & Schuster. ISBN 0-684-81906-6. The Sveriges Riksbank Prize in Economic Sciences in Memory of Alfred Nobel on the Nobel Foundation's web site.